Film study is not only important, but an essential approach in discerning the truth about a player’s ability. It is also an inexact science. We’re all at the mercy of our own brains, which despite our utter dependance on them, we don’t fully understand. We fail to process some items properly, we misread cues and signals and most of all we fail to appropriately assign weight to certain observations. It’s the dreaded “I just couldn’t get that one game out of my head” syndrome. In the lead-up to the 2015 NFL Draft I fell victim to that very syndrome with former Kansas State and current Seattle Seahawks wide receiver, Tyler Lockett. In studying Lockett against Oklahoma, I couldn’t help but notice that a certain feisty, physical press corner kept working over the 5’10, 180-pound wideout at the catch point and in press coverage. That player, Zack Sanchez, went on to be a Day 3 pick of the Carolina Panthers this past April. I figured that bigger, faster and even more technically discipled NFL cornerbacks would make the diminutive receiver’s life hell in the pros. All that based on a single individual matchup within one game. I couldn’t let it go, I slid him down to the 16th spot in my pre-draft rankings, and my brain blocked out all of Tyler Lockett’s positive attributes. I was wrong. Those sort of mistakes are prevalent when you just sit down and watch film without a strong rubric or process to log the observations. Removing those sort of cognitive barricades is a big reason why I developed the Reception Perception methodology. The process lessens my role of interpretation and keeps an honest log of what actually happens on the field. Of course, prior to working with NFL Media I did not have full access to college all-22 film for charting draft prospects. Perhaps my evaluation of Tyler Lockett would have been different through the lens of Reception Perception. One year later, with a full eight-game sample from his rookie year, my stance on the player is certainly different. After a slow start to the season, Russell Wilson closed 2015 on a murderous efficiency pace. He threw for less than three touchdowns just once and completed under 70 percent of his passes in only two contests from Week 11 on. That’s around the time when already stellar return man, Tyler Lockett, became a regular contributor to the offense. He caught five of his six touchdowns in that timespan. The truth is that Lockett was getting open routinely at every level of the field. When he got opportunities and targets, the rookie wideout made the best of them. 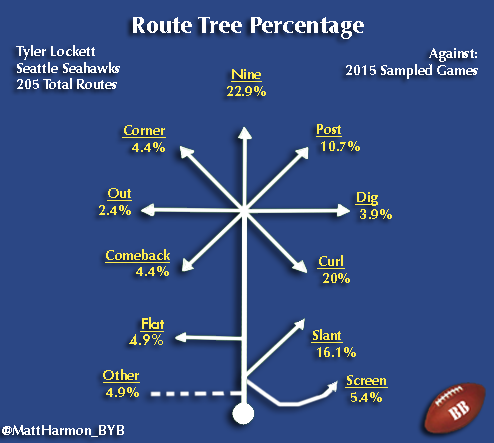 Russell Wilson targeted Lockett on only 18 percent of the 205 routes he ran over his Reception Perception sample. Lockett was wildly efficient with the chances, catching a pass on 13.7 percent of those routes and hauling in 75.7 percent of his targets. Despite having hands measured out in the fourth percentile, per Mockdraftable, Lockett displayed some of the best mitts charted this season. He dropped just one pass over his Reception Perception sample, good for a rate of 2.7 percent of his targets. One of my clearly faulty pre-draft hangups with Lockett based on that one game was his performance in contested situations. While he only registered five contested catch attempts in his sample, he came down with a sterling 80 percent conversion rate. If continued growth in this area is ahead, Lockett displays all the necessary trump cards to become a long-term NFL star despite his size. While Lockett passes the test when it comes to clean hand technique and catching the ball in traffic, these are only stepping stones to get to the true majesty of his game. Anyone who saw Lockett return kicks in the preseason last year knew he had special on-field speed. It helps, but speed is one of the most overrated tools in the art of separating from coverage. Even the fastest of receivers must integrate that tool with proper deception, technique and a physical mindset to consistently work open. Tyler Lockett’s route portfolio and performance across the tree serves to show what kind of a talent we’re dealing with here. ​To take advantage of his vertical ability, the Seahawks dialed up nine routes at an above average rate of 22.9 percent. Elsewhere on the tree, Lockett uses his quickness at breakpoints, running a healthy amount of slant and deep post routes. After the nine-route, his second most utilized pattern was the curl at a 20 percent rate. Michael Crabtree’s 2014 Reception Perception evaluation served as a reminder that performance on the break-back route can be a quiet indicator to the true route-running acumen of a player. While Lockett’s percentage chart is a bit more skewed to the in-breaking routes and vertical patterns, he mixed in a healthy amount of attempts toward the outside. His comeback, flat and out percentages were all under the league average but that’s not uncommon for the Seattle receivers. Because of the unique style of quarterbacking Russell Wilson plays and heavy use of play action, their route assignments can often trend toward the simplistic side. Lockett’s veteran teammate, Doug Baldwin, ran far more flat routes (14.1 percent) but otherwise his route tree shied away from heading outside. When viewed alongside his teammates, we can speculate that Lockett’s rather rudimentary looking route percentage chart may have more to do with the environment he’s placed in not the player himself. In order to truly understand Tyler Lockett’s route-running prowess, we need to examine his Success Rate Versus Coverage scores. His performance across the route tree proves his worth without a shadow of a doubt. 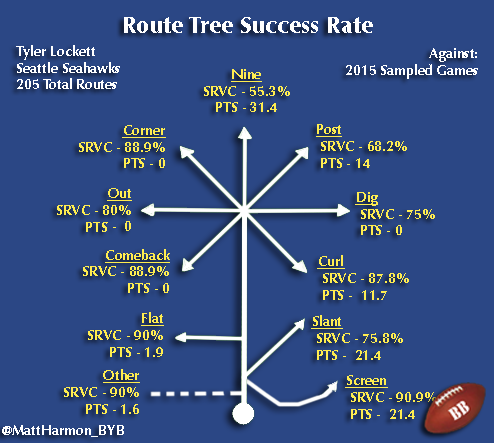 Tyler Lockett posted an above average SRVC score on every route on the tree outside of the screen, which is so incredibly fluky you can feel free to ignore the figure. Josh Doctson accomplished a similar feat as a college prospect, but otherwise, such performance in SRVC is reserved only for the best-of-the-best tier in Reception Perception. Once again we come back to Lockett’s deep playmaking ability. His 55.3 percent SRVC is a strong score demonstrating not just his wheels, but how he can sell the cornerback on his intents to stay shallow before darting downfield. Lockett has the ability to get on top of a defender in a hurry. When he’s on, not many wide receivers truly make the difference in play speed compared to their defenders look so stark. Look for Lockett’s 31.4 PTS figure to rise during the 2016 season. Even as he was lighting up the football world, there were at least four plays during Lockett’s Reception Perception sample where Russell Wilson just missed his new wideout streaking deep down the field. If those attempts start converting this season, Lockett’s deep game production could go through the roof. Lockett’s 87.8 percent SRVC on curl routes is one of the better scores ever posted, and second-best charted so far for 2015 (Willie Snead - 88.1). Again, this pattern shows not only Lockett’s ability to sell the vertical route, but also his quickness at the break-back point of the route. Lockett changes directions with great fluidity and you’ll often see him leave cornerbacks aghast when they discover he’s already turned around while they still pedal downfield. This ability is also exemplified in his pristine 88.9 percent score on comeback routes, one of the most difficult patterns to execute for the average NFL receiver. The football world at large knows all about Wilson’s tendency to go off-script and improvise as a running/passing hybrid player. On those plays, his receivers must be on the ready to break off their routes and find creative ways to stay open while their quarterback is off the predictable beaten path. In Reception Perception, those routes fall under the “other” category. Lockett posted a fine 90 percent SRVC on the other route, showing he belonged in this unique offense. When viewing Lockett’s overall SRVC scores, we wipe the fog off the mirror to see a clear reality unfold. This young receiver enters rarified air with his Reception Perception scores. In terms of SRVC against man, Lockett’s 76.6 percent score is the second best mark for a rookie receiver. He only trails Odell Beckham’s still unbroken 80.1 percent mark from 2014 and comes in ahead of two well-known Reception Perception darlings Allen Robinson (71.7 percent) and John Brown (72.7 percent) from that rookie class. Doug Baldwin recently stated that Lockett is “taking his craft to the next level” this offseason. Any step forward in the art of separation would push Lockett to unprecedented heights in the pantheon of NFL receivers. He already got open at a wildly successful rate as a rookie, and it’s clearly his best skill. One area Baldwin made a note of Lockett’s work to perfect his craft was at releasing from the line of scrimmage. If you remember, my faulty tape-watching cognitive bias on Lockett heading into the 2015 draft had me worried about his ability against press coverage. The rookie wideout soared right past those concerns just like he does defenders off the line. Lockett’s 76 percent SRVC against press is well above the league average. Defeating press coverage is a must for a wideout to ascend to the top ranks in the league. It’s one of the most important traits when scouting the position. Two more high-profile rookies from 2015, DeVante Parker and Devin Funchess, posted two of the worst SRVC against press ever recorded in Reception Perception. Perhaps this, and injuries to Parker, were big reasons why neither made a season-long consistent route-to-route impact. Lockett, on the other hand, already showed the ability to routinely work free from tight coverage, despite being dwarfed by his peers. There’s no match for clean, decisive technique when mixed with a player possessing his form of quickness. Many of the readers who closely follow Reception Perception have been dying for a “this year’s Allen Robinson” after enjoying the Jaguars’ breakout star in 2015. For months, I’ve insisted that what happened with Robinson, and his permeant relation with the series’ success was a special occurrence. “There won’t be an Allen Robinson situation every year,” I said at every chance I could. After his wildly impressive Reception Perception results, Tyler Lockett has me re-thinking a stance I didn’t think I’d budge on. Lockett’s SRVC against man coverage, his pristine performance across the route tree and surprising proficiency at winning contested catches foretells that he has a clear path to NFL stardom just as Robinson did one year ago. Now let me provide a few words of caution for my fantasy football followers. As Living the Stream’s Denny Carter pointed out this offseason, Robinson benefitted from a “perfect storm” effect for fantasy football success. Much of that had to do with the all-world talent Reception Perception showed he had, but his team constantly playing from behind and a dominance in both the red zone and target share boosted him to top-five fantasy receiver status. Most likely, Lockett only keeps pace in the ability category as the Seahawks might not afford him the volume Robinson got in Jacksonville this season. Carroll’s comments only further bring evidence to the idea that the Seahawks are changing their approach. They spent a Day 2 draft resource to acquire a receiving-first running back and their primary bell-cow replacement for Marshawn Lynch is still unavailable. Carroll openly talked about Wilson taking that last step forward in his development. Now is the time for the team to hand over the reigns to one of the NFL’s most efficient quarterbacks, and they know it. Most important of all, the Seahawks have never had a receiving corps like they do now. Doug Baldwin legitimately took a big step forward last season, and as his Reception Perception results show, Tyler Lockett is on the verge of stardom. You can throw out the history of Seahawks receivers in this coaching staff’s era. We have something different on our hands. I know for sure after digging around that the Seahawks are wildly high on Tyler Lockett, and his standing with a team is surely a big factor in moving the offense past the Lynch-centric days of old. Tyler Lockett might not follow along Allen Robinson’s path to a top-five fantasy season finish, but it won’t be long before he too is regarded as one of the NFL’s best young receivers. He already entered rarified air with his Reception Perception results as a rookie. If the rest of the exterior factors ever catch up to his immense talent in the art of separation, well, you know how that story ends.